Come and learn about the exciting history of the Texas Cattle Barons! 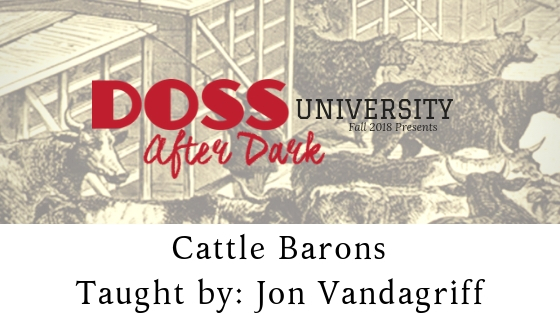 Spend your Thursday Nights this fall learning about the exciting history of the Texas Cattle Barons! Join Jon Vandagriff October 11th-November 1st at the Doss. Classes begin at 5:30 and last approximately an hour. Cost is $30 for all four weeks and $20 for Doss Partners. All proceeds go back into the Doss Educational programs and exhibits!